CLIFFSIDE PARK – The drums were pounding, the stands were packed and the adrenaline was flowing. Cliffside Park pride is officially back as the scene of Monday’s North 2 Group 3 semifinal was reminiscent of the glory years the program experienced from the late 2000’s through the early portion of this decade. But as time winded down in regulation against upstart Matawan, that adrenaline turned to concern as the Red Raiders were unable to crack Matawan’s tightly-knit defense. Facing the prospect of overtime and possibly penalty kicks, the Red Raiders kept coming in waves before finding the back of the net just in time. 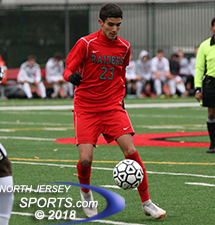 Luka Kozomara and Kerry Quevedo worked a give-and-go with Kozomara drilling a shot into the lower left-hand corner with 1:17 to play as ninth-seeded Cliffside Park sent the partisan crowd home happy and earned a berth in the North 2, Group 3 section final with a 1-0 win over No. 12 seed Matawan in Cliffside Park. The Red Raiders held a sizeable edge in possession throughout. However, that did not translate into scoring opportunities in the first half as they got off just two shots on net. Although there were some personnel changes made at halftime by Cliffside Park head coach Carmine Cambareri, the philosophy stayed the same. As the rain came down, the Red Raiders started to break down the Huskies’ back line and quality scoring chances soon followed. Erik Moreira and Cliffside Park will travel to Millburn for the section final on Thursday. Kozomara and Gabriel Costa both had looks from the top of the box that went wide of the left post. With 10 minutes to play, Edson Almieda nearly scored on a corner that was only kept out of the net on a nice grab by Matawan keeper Mike Mallozzi. The Huskies packed the middle of the field hoping to keep the game scoreless and eventually force penalty kicks. The only way the Red Raiders could solve the mystery of the Matawan defense was quick two-touch passing. Kozomara and Quevedo used that method to perfection on a counterattack for the game-winner. Kozomara delivered a pass to the middle of the field and made a run with Quevedo playing the ball into space. Mallozzi came off of his line to cut down the angle but to no avail. Kozomara ripped a low-liner just inside the left post with 1:17 to play to put the Red Raiders ahead. The home fans were going crazy and the Red Raiders themselves felt confident that the game was locked up. But after not allowing a quality scoring opportunity for the first 79-plus minutes, they nearly squandered their lead just 40 seconds after grabbing it. Marcelo Colonna hit a knuckling volley from 15 yards out that looked destined for the back of the net. Despite being largely inactive throughout the game, freshman goalie Cristian Argueta showed he was still in the game mentally by making a huge one-handed diving save to help preserve the Red Raiders’ trip to the section final for the first time since 2012. Cliffside Park will head back on the road to take on third-seeded Millburn for the North 2, Group 3 title on Thursday. Beating the Millers on their home field will be no easy task, but with the pride now back in the program the Red Raiders want more…they want the hardware.